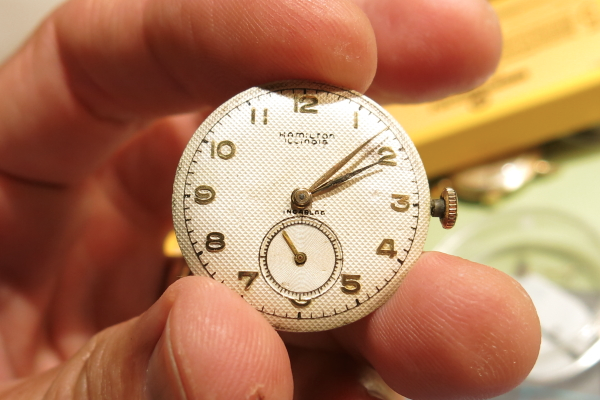 In the late 1920's the Hamilton Watch Company purchased the Illinois Watch Company. 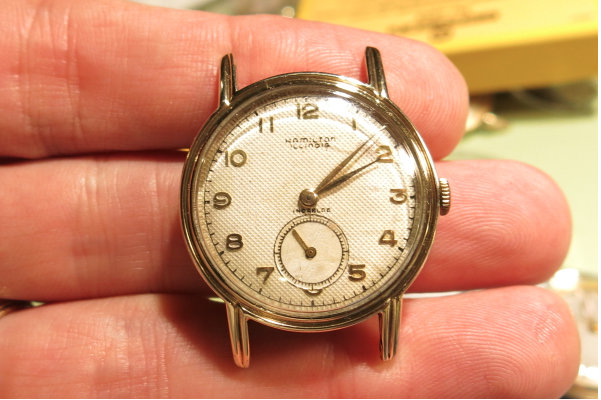 Illinois branded watches continued to be produced for several more years but by the mid-1930's all Illinois production ended. Hamilton continued to own the Illinois trademark though and in the 1950's they reintroduced the Illinois brand with a line of entry-level watches warranted by the Hamilton Watch Company. The "new" line of Illinois watches really has nothing in common with the old Illinois brand, other than the name. 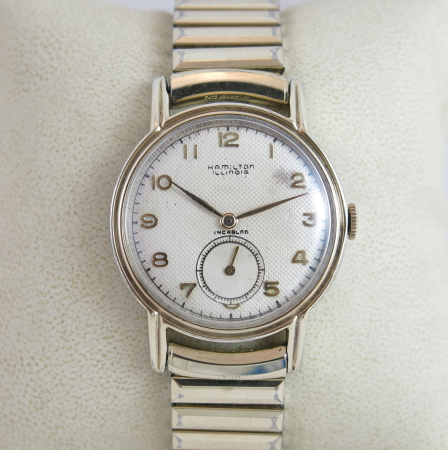 An example of a "new" Illinois watch is the Debonair Model D. As you might surmise, there's a Debonair Model A through F. There are also other men's and ladies series with similar model nomenclature. All of the Illinois models featured various Swiss-made movements. 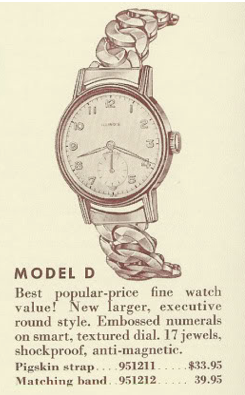 The Debonair Model D was produced for three years, after which it appears Hamilton gave up on the Illinois brand and marketed Swiss-made movement-based watches as the entry level Hamilton lineup. Inside the Debonair Model D is a Swiss A-Schild AS 1200. 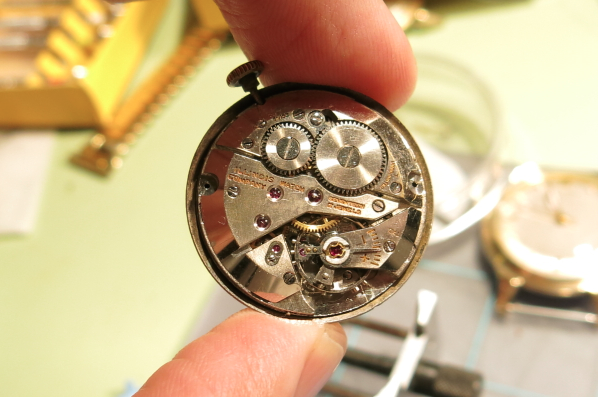 This is the same movement used as the Hamilton 673, but it's marked "Illinois Watch Company". The case is 10K yellow rolled gold plate (RGP) with a stainless steel back. The embossed dial is textured and looks like a woven linen. I recently purchased a Model D just out of curiosity. The seller listed it as "not working, the battery is dead". This isn't the first mechanical watch I've bought with a "dead battery". Had the seller bothered to wind it they would have realized it was actually working! As received it was pretty dirty. I cleaned it up a bit before getting around to servicing it so it doesn't look too bad in the picture below. Without the crystal in place you can really see the details of the textured dial. The movement was in decent shape. I find it interesting that the Swiss manufactures used shock-resistant cap jewels on their balances before Hamilton introduced them on their own movements. 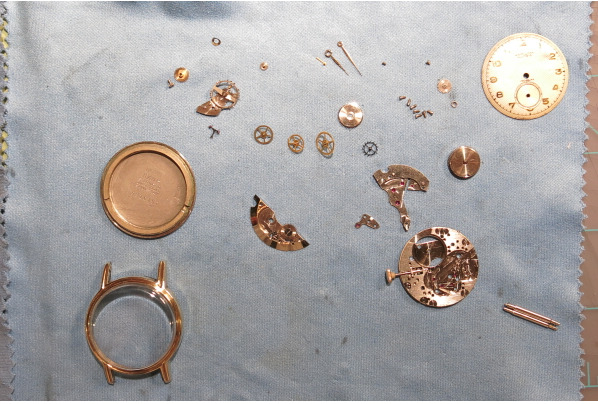 All taken apart and waiting for assembly, it looks just like any other Hamilton movement. Here is an interesting shot of my watch timer. Horizontal lines indicate the watch is running "on time". Trending up (from left to right) would indicate it's running fast. 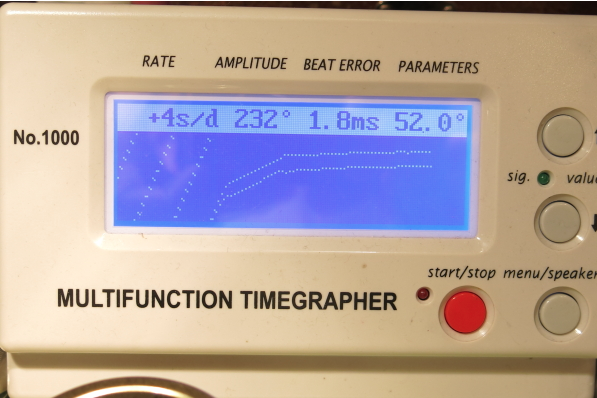 Looking as the chart below, you can see originally this watch was running quite fast (about 200 seconds per day) and you can see the slope decrease as I tweaked the regulator. By the time I finished it was down to running about 4 seconds per day fast. And here it is all reassembled. The dial has a smudge near the 2 that I couldn't clean off with gentle cleaning. I didn't want to try too hard and risk losing the printing on the dial so we'll just have to accept it as is and call it an "age spot".